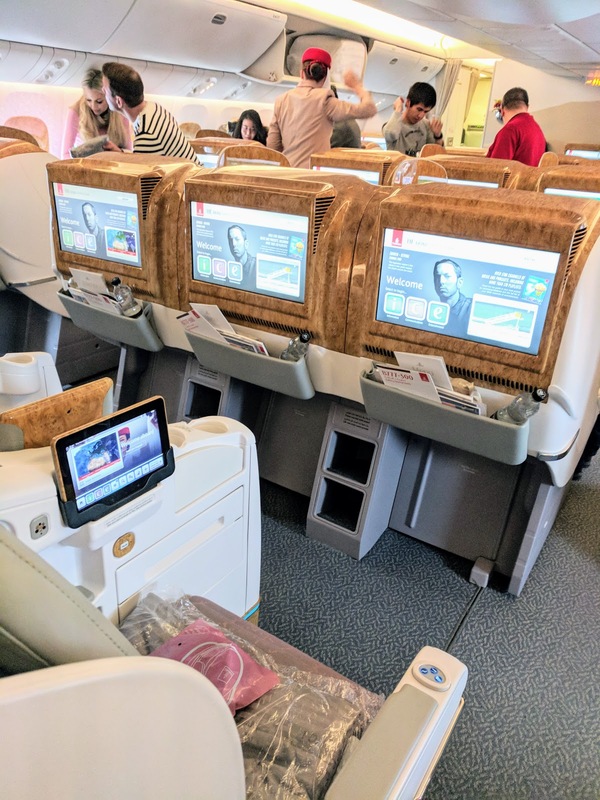 I recently had the opportunity to fly Emirates Business Class from Dublin to Sydney via Dubai for a work trip. 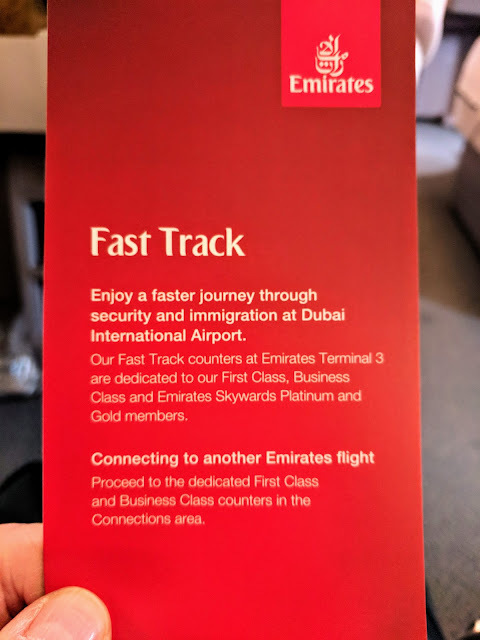 Emirates Airlines has a reputation for being one of the best carriers in the world. 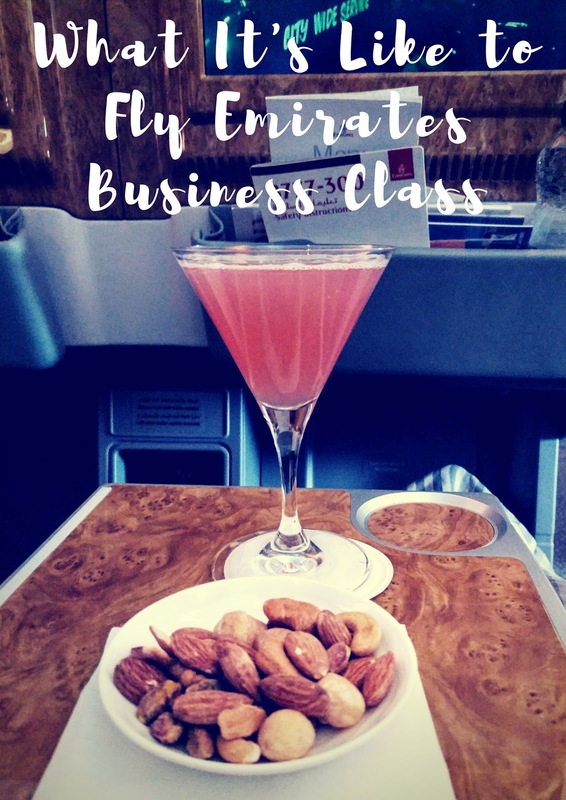 Read on to find out how my business class experience stacked up in practice on the Emirates 777 service from Dublin to Dubai and the Emirates A380 long haul service from Dubai to Sydney. 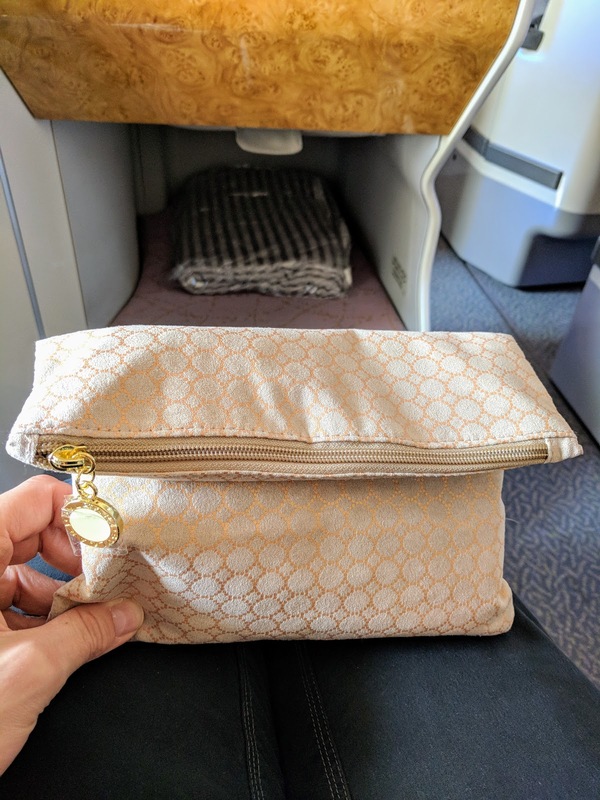 How Did a United 1K Star Alliance Girl End Up Flying Emirates Business Class? I am most definitely a Star Alliance girl. Given all the travel that I do to California from Dublin, using United and Lufthansa, members of the Star Alliance, is a logical choice. I currently have 1K status on United but don't fly enough to maintain that status and check out other airlines on the side. 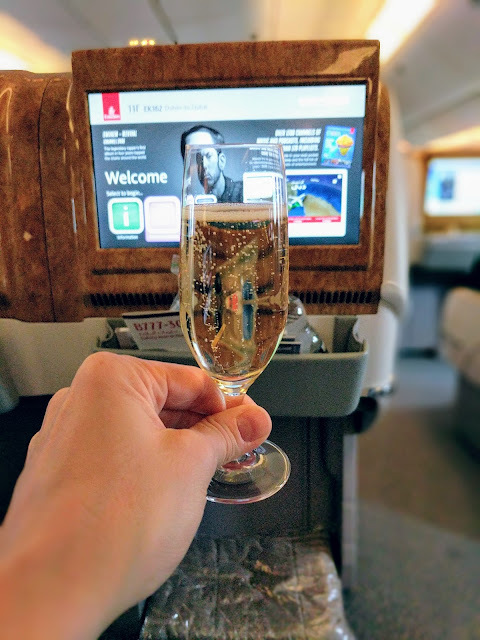 So, how did I end up on an Emirates Business Class itinerary from Dublin to Sydney? The simple answer is: The Beast from the East. My Dublin to Sydney itinerary was originally booked via London and South Korea on Asiana Airlines, a member of the Star Alliance. I'd even built in a couple extra days in London before the long haul to make sure there would be no issues if I encountered slight delays. 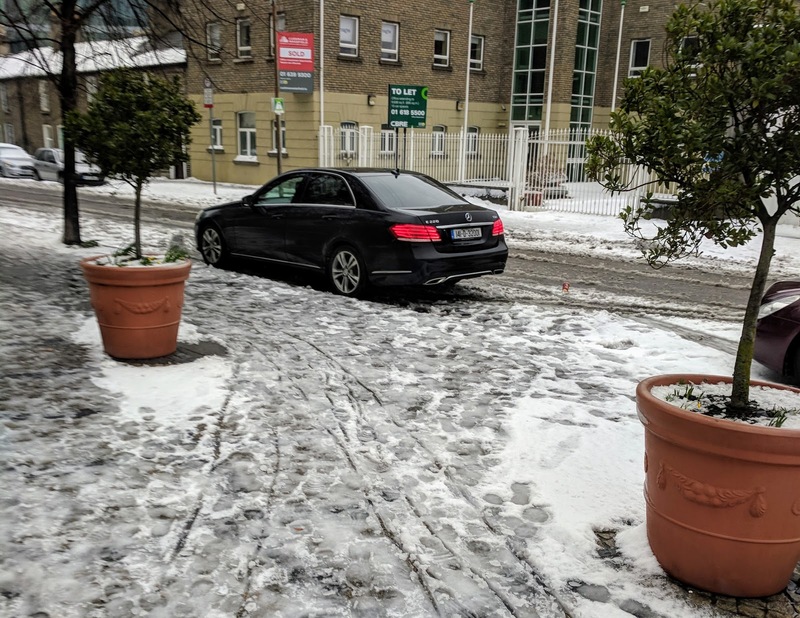 I showed at the airport on Wednesday, the day before the brunt of the snow storm was supposed to land in Ireland, hoping to make it out to London. Watching the Departures board at Dublin Airport, flights started to be marked CANCELLED. My flight continued to be listed, one of the only ones that still hadn't been called off. 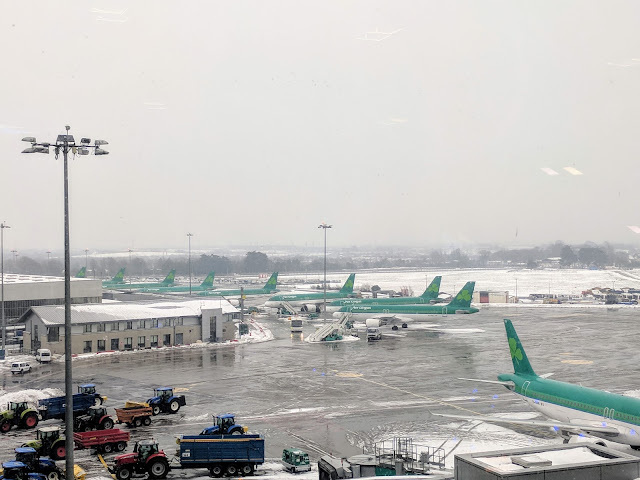 Then Aer Lingus made the decision to cancel all remaining flights that day. After 10 hours at the airport (starting at 4 am), I was going nowhere. The storm was predicted to hit on Thursday and Ireland was expected to be incapacitated with the airport closed at least through Friday evening. What could I do? I figured that on Saturday, I'd be more likely to get out of Dublin on an international long haul rather than a flight to London. On a whim, I checked the prices on Emirates. 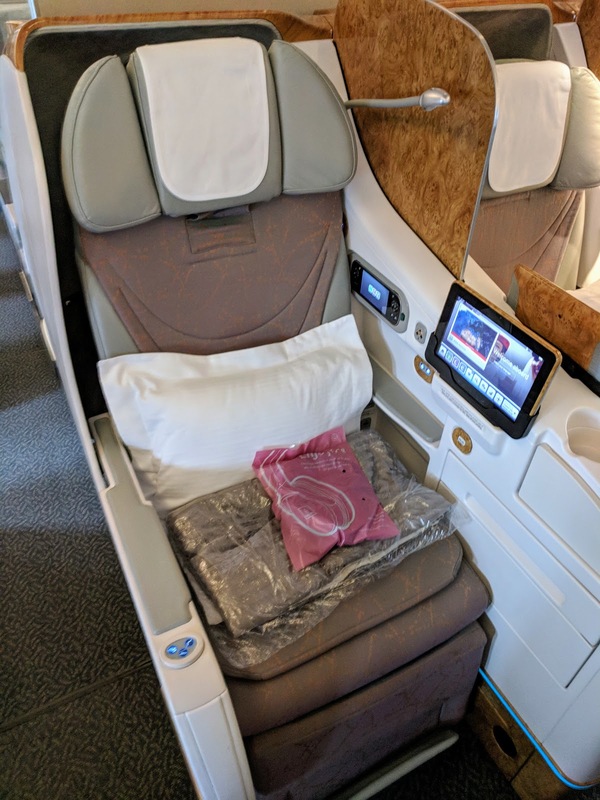 At around 4500 EUR for the last minute fare, it was definitely more expensive than what I'd paid on my original business class flights on Asiana but I had no choice but to book it. I needed to get to Sydney for work. 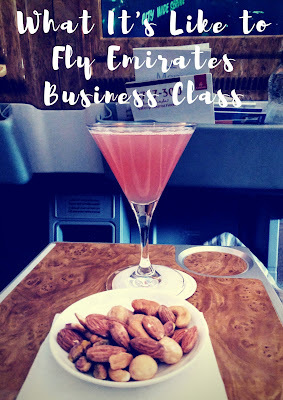 Thus, my Emirates Business Class odyssey began. 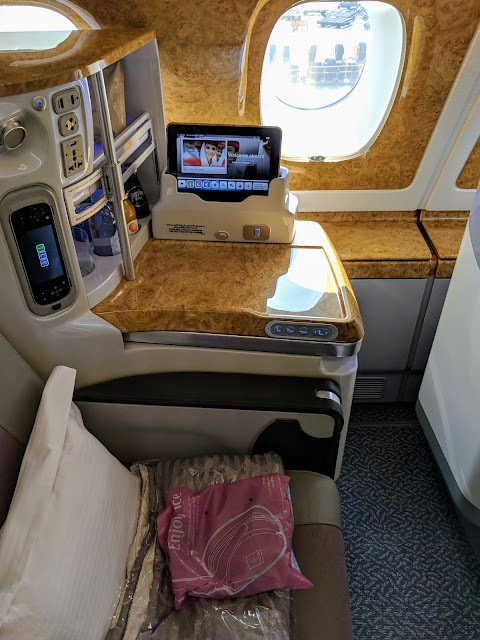 I was excited to learn that when you book an Emirates Business Class ticket, you get free chauffeur service to and from the airport at your origin and destination. This worked out really well for me since The Beast from the East storm meant that there were fewer taxis working on the date of my departure. I was picked up in a black sedan by a driver wearing a jacket and tie. Very fancy and very helpful. I could get used to this. After a couple hour delay due to lingering weather issues, I finally boarded an Emirates 777 for my flight from Dublin to Dubai. The seat felt a bit like a throne with a large TV screen and faux wood paneling. A pillow, blanket, and noise cancelling headphones awaited me. 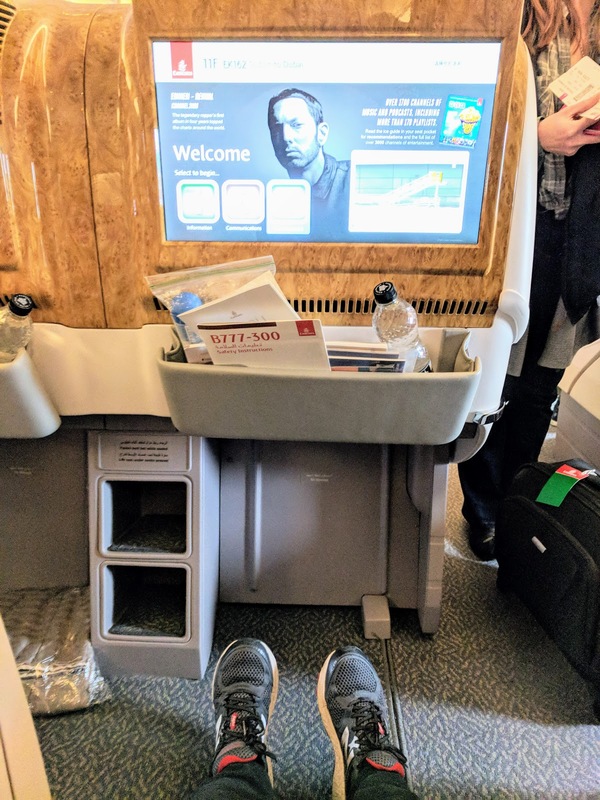 Of course, there was plenty of legroom on the Emirates 777. I soon learned that Emirates is all about champagne. I enjoyed a glass of Veuve Clicquot as we awaited take-off. After take-off, the flight attendants came around to take our drink order. 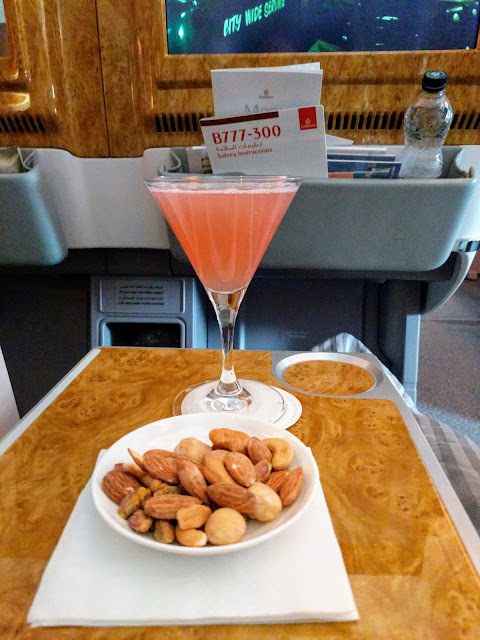 In Emirates Business Class, you can order a signature cocktail to accompany your premium warm nuts. There were 12 cocktails on the menu. I opted for a classic Cosmopolitan. 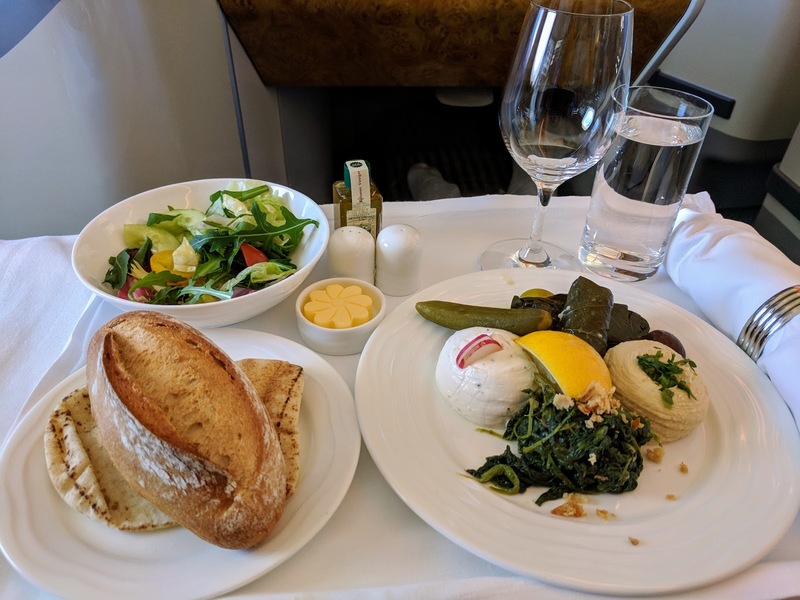 The food on the Emirates Business Class 777 service was fantastic. We were served a gourmet 3 course meal with fine wines. The main course portions were a good size. Dessert was a little smaller but the chocolate fudge brownie that I had was rich and dense. I definitely felt satisfied at the end of the meal. Once the dishes were cleared, the flight attendants came around and asked if we would like a mattress. A thin cushion covered in a sheet was then placed over the seat. 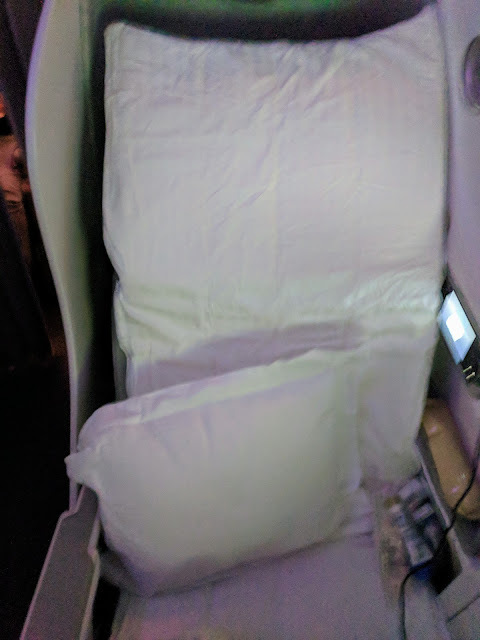 Emirates Business Class seats on the 777 recline flat so it was like creating a bed for the night. Once the lights in the cabin were dimmed, pinpoints of light appeared on the ceiling emulating the stars above. 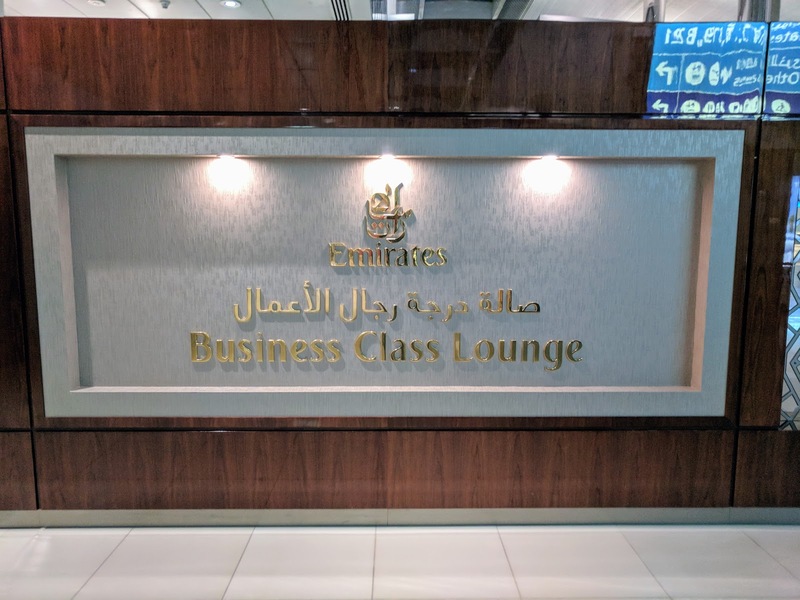 Emirates Business Class also entitles you to Fast Track Service in Dubai. This isn't really that valuable unless you haven't gotten a boarding pass yet and need to speak to an agent. Also, if your final stop is Dubai, Fast Track should help you speed through immigration. I headed straight to one of the Emirates Business Class lounges upon my arrival at Dubai International Airport. 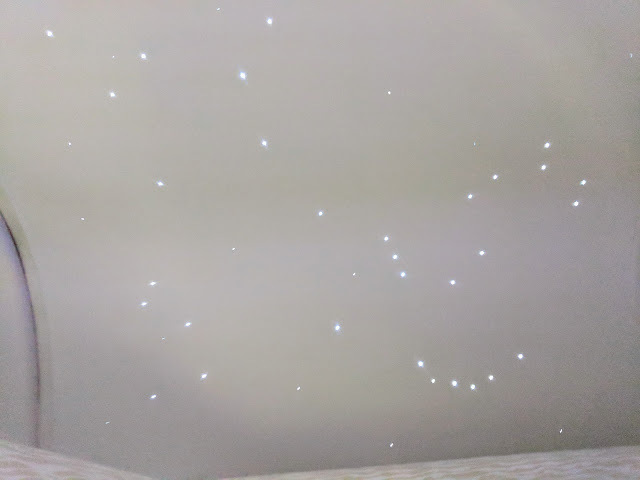 I showed my onward ticket at the entrance and was soon admitted to a lavish lounge experience. The lounge that I visited extended across the entire upper floor of the airport terminal. I looked down and could see passengers milling about or hurrying to their gates below. 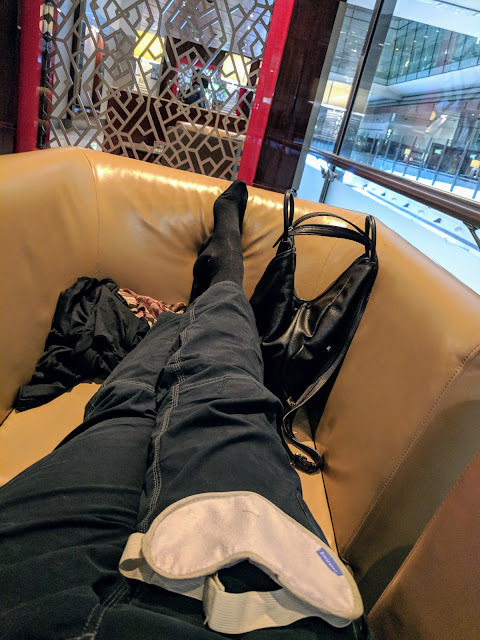 From end-to-end, the Emirates lounge was at least 500 meters in my estimation. In the Emirates Business Class Lounge in Dubai, you'll find food choices from around the world at different stations. Voss water from Norway is the standard non-alcoholic beverage. 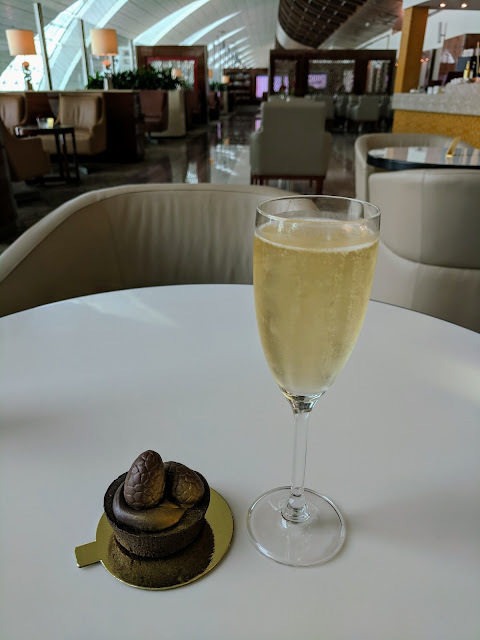 Of course, I stopped into the Champagne Lounge for a glass of bubbles before looking for a quiet corner to take a nap. The lounge was fairly quiet when we landed (in the middle of the night in Dubai). My layover was about 10 hours. There are a number of areas where you can stretch out and take a nap in the lounge. All of the nicest sleeping spots were taken when I arrived (both the cots and lounge chairs) so I made do by pulling two chairs together. 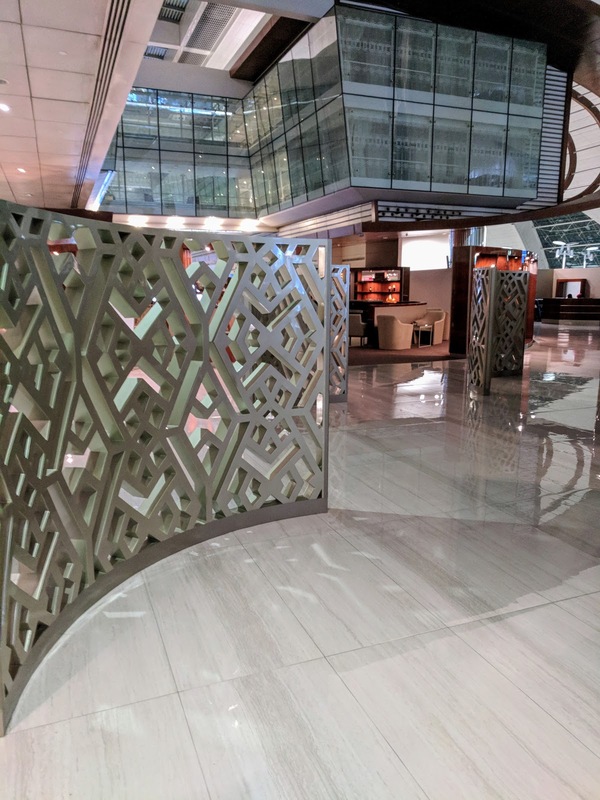 The Emirates Business Class lounge in Dubai also features top notch toilet facilities and showers. You can pick up a toothbrush/toothpaste kit in any of the bathrooms. The showers can be quite busy and you may have to wait for a stall. If you have a long layover like I did, it's worth timing your trip to the shower for when the lounge is quieter. The second leg of my Emirates Business Class itinerary was on an A380 from Dubai to Sydney. 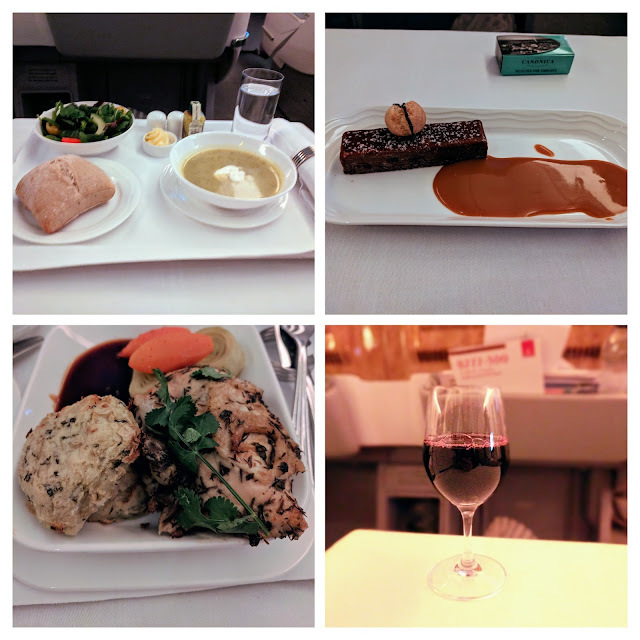 Even more wonders were in store on this super long haul flight than I had experienced on the Emirates 777 service. For extra long and overnight flights, Emirates hands out a Bulgari amenities kit. There are two different versions for men and women. The kits come in an exclusive designer bag. Note that the amenities kit contains an eye mask but does not include ear plugs. If you are a light sleeper, make sure to bring your own ear plugs for the flight or plan to sleep with your noise-cancelling headphones on. The business class seats on the Emirates A380 service even include a small mini-bar featuring water, juice, and snacks. The seats are configured in a 1-2-1 configuration. The seats near the window alternate between having the seat on the inside or outside. I booked my ticket last minute and the more private seats closer to the window were taken. The center seats alternated between "together" and "apart". If you were traveling with someone, you could select the "together" configuration which puts the seats closer and the mini-bar and shelf on the outside. If you are traveling alone, you can sit "apart" where your seat is closer to the aisle but you'll have more privacy with the mini-bars separating you from your neighbor. 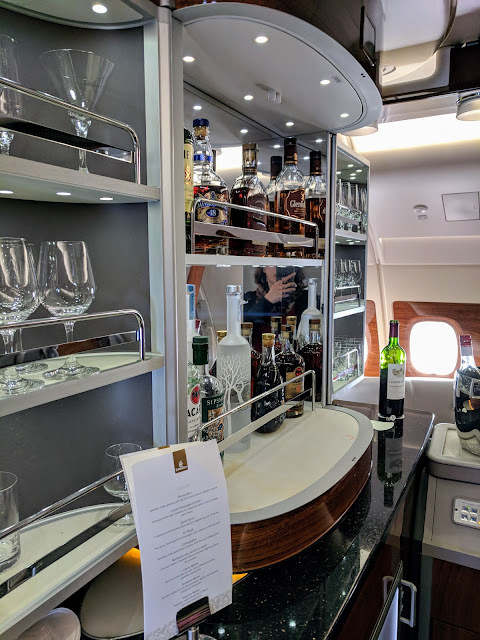 Emirates Business Class service is definitely boozy so I wasn't at all surprised to find a walk-up bar at the back of the plane. 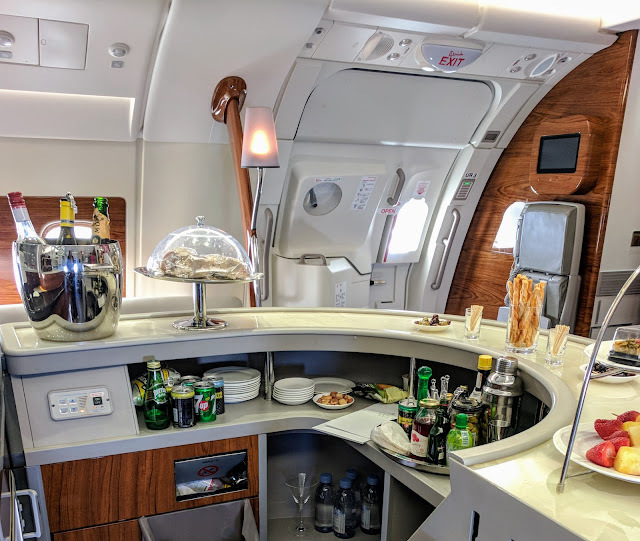 During the flight (assuming the seat belt sign was off), you could wander to the back of the plane for a cocktail or a snack. Of course, the Emirates Business Class A380 service also featured gourmet meals. I was so full, in fact, after my main that I had to decline dessert. That never happens! Toasting a Successful Trip...with Champagne of Course! After over 24 hours in transit, I finally arrived at my destination where my chauffeur was waiting to take me to the office. On my way back to Dublin after a successful business trip in Sydney and a fun vacation in New Zealand (more on that coming soon! 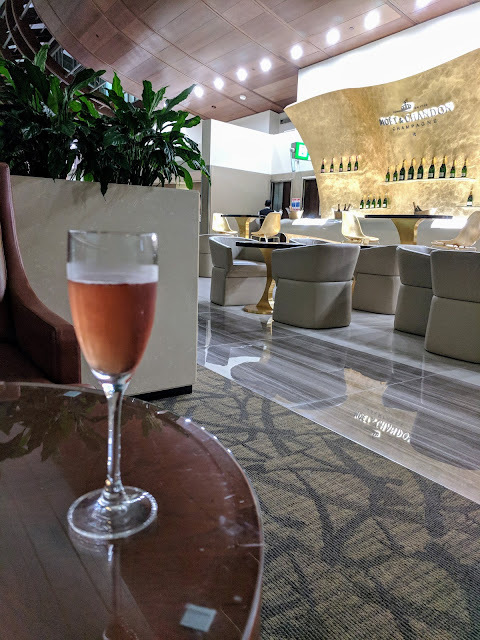 ), I couldn't help but toast to a successful trip in the lounge in Dubai...with champage, of course! Find out what it's like to fly Emirates Business Class from Dublin to Sydney via Dubai. Get the scoop on Emirates free chauffeur pick-ups, champagne and cocktails, fine dining, and more.